Download JamFeed for free right now and follow Spencer Ludwig to stay up-to-date with all of his latest news, releases, and tour announcements as they happen in real time. 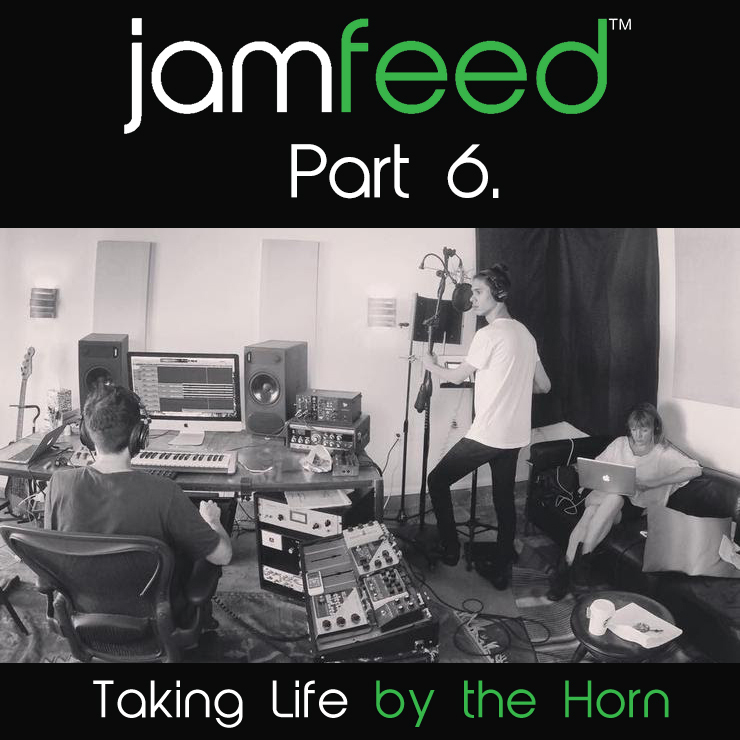 The first five parts to ‘Taking Life by the Horn’ can be found on his JamFeed artist page. When I went on vacation to Italy earlier this year, I took a tour of the David in Florence. Creating music is very similar to how the David came about. You start with a giant slab of marble and you need to keep chipping away until you get your very own David. Spencer Ludwig’s David is still a work in progress, but one that is taking shape even faster than he himself could have anticipated. Just when I thought that his schedule couldn’t possibly be any more hectic, he decided to start chipping away at his marble with both hands. But even with a new daily routine that includes a session from 11 am to 6 pm, followed by an 8 pm to 3 am session, Spencer understands that part of creating a David is taking the time to appreciate the process, and trying to grasp the importance of the moment in real time. In part two of Taking Life by the Horn, I had written that he would be playing a trumpet rendition of the National Anthem live at Dodgers Stadium on August 11th. Well, that performance happened, Spencer crushed it, and just as he had promised in the aforementioned piece, his family was standing proudly by his side to witness it. The performance was an increasingly rare moment in the life of Spencer Ludwig in which he was able to walk away from his marble slab, if only for an afternoon, and — to put it simply — appreciate it. Spencer’s father Allan — pictured below to the right of Spencer — is the big sports fan of the family. However, the two women who accompanied the Ludwig men under the shining LA sun that day at Dodgers Stadium were equally proud, as they watched Spencer’s trademark thick black waves of hair completely engulf his face during the final notes of his passionate performance. Allan Ludwig, along with Spencer’s mother Mia Valencia, didn’t only raise one musical prodigy. When I asked Spencer about his little sister Savannah (pictured to his left), he gave her the same type of glowing review that he reserves for only the most ingenious of songwriters. “I am just now learning how to sing, but Savannah was born to sing. Her voice is incredible. She wakes up and sings all day every day, and there’s nothing else in her world that matters,” he says with a glowing, brotherly love. The 25-year-old Spencer has a seven-year age difference with Savannah, and he is enjoying being able to relate with her more and more as both of them venture further into adulthood. Comparatively, his relationship with his own voice is also venturing into a more mature, confident, and relatable stage of being. “I used to try to sing really ‘pretty,’ like with a super soft tone. Now I’m discovering all kinds of tones. I don’t care. I’m having a lot of fun with it and going for a raw, funkier feel. The personality of my voice is revealing itself in the process of song writing. If I want to use any of the first songs that I wrote for the album, I will definitely be re-singing them with all of this in mind,” says Spencer. His David is taking shape. Every curve, every edge. Read on to hear more. “I had two days to work with Shea Taylor. I’m used to eight hour sessions, so for him to book me for two days let me know that his team is serious. I found out about him because I was doing this thing that I do where I listen to music I love while looking up who wrote which song, and I found that he wrote ‘Love On Top‘ for Beyonce, which is one of my all-time favorite songs of hers. It’s such an incredibly amazing and classic song. Shea has a studio right on the main strip of Santa Monica a couple blocks from the water. I walked into the room and told him that I’m a huge fan of his, and that I was so grateful to be in the room with somebody who’s made music that has helped shape me. We ended up writing five ideas on the first day — the ‘getting to know each other’ day. We were just catching a vibe. I’ve been saying that a lot, but it’s true. that’s exactly what we were doing. We started from scratch on day two and saw one idea all the way through. It’s one of my favorite, absolute best songs. I’m so excited about it! I can’t believe that one of my all-time favorite songs of mine was written with a guy who wrote one of my all-time favorite songs (laughs). It has that R&B/soul influence that I’ve been itching for. “Jesse Shatkin is one of the most buzzed about young producers out there. His name is flying around all over the industry because he went from being a DJ in LA to Grammy-nominated producer in a very short amount of time. He co-wrote and co-produced ‘Chandelier‘ by Sia and now it takes a month to schedule a session with him. Before that song blew up he was the in-house engineer for Greg Kurstin. Jesse personally recommended Fran Hall. She’s a really great lyricist and top-line melody person. I’ve said this before, but three is a great number to write a song. You need a producer, someone to work on lyrics, and then me, who does a little bit of everything. It goes really fast with three people. I’m able to take on different personalities based on how the song wants me to sing. Sometimes I’m loud, sometimes I’m soft, sometimes I sing low, sometimes I sing high. Different styles of music bring out what’s naturally within me. Jesse and Fran brought out a different aspect of me. They pushed me to do something different, I discovered another tone in my voice that’s really fun to mess with, and we ended up writing a song with one of the coolest choruses I’ve written yet. “Working with Ross and Nick was much easier this time around. We already knew how we worked and what we love, and we were ready. I get along so well with those guys as both musicians and as people, and we just have fun together. They are brilliant people. They’re like mad scientist musicians. They know how to talk about music and play it on such a high level. They’re the kind of guys who will be like, ‘you could do this chord, or this chord, or this chord, or even this chord’ (laughs). It’s so unique. It makes the possibilities infinite. I want this album to be super eclectic and showcase different sides of me and stimulate people in different ways. The last thing I want is for people to hear one song and say, ‘oh okay, I get this guy because I like that one song and everything else sort of sounds like it.’ No. That is not my aim. “Michael Tighe was the original guitar player and songwriter in the Jeff Buckley Band. When it comes to connecting lyrically, he is one of my top connections. Maybe even the top one. The chemistry is unbelievable. He understands my character as an artist. When we write lyrics we talk, laugh, and get it out. We come up with really interesting lyrics really quickly. I’m not putting as much pressure on my lyrics in my LA sessions because I know that I can take them back to Michael in New York. I’ll be doing a whole week of double sessions with him soon. After every writing session I write a little something regarding what I loved about working with the artist. It’s like my own personal writer’s diary, or a roster of artists with little biographies of each one. As I move forward, I’m able to go back to this list and look up who to work with based on what I need. It’s a way for me to create really efficient writing sessions. I want to be a songwriting machine.